The RAID II is an update of the famous Lightfighter RAID pack. While the RAID was the premier assault pack, through hard use some areas of improvement were found, and addressed with RAID II. The face of the pack has a zippered utility pocket for fast stowing of items, while maintaining the PALS webbing of the original pack. 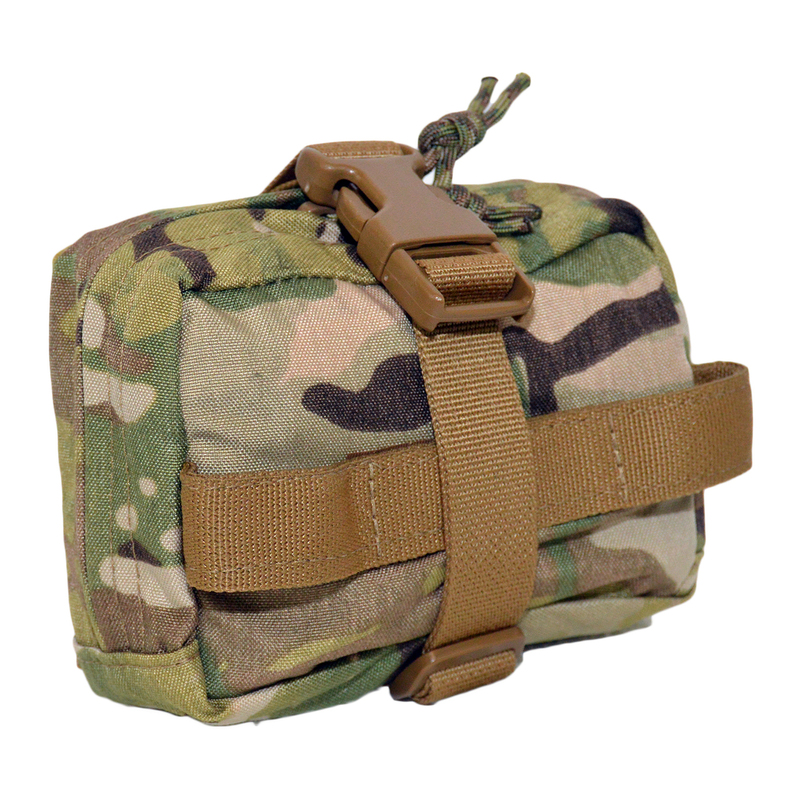 The inside face of the pack is also supplied with PALS webbing, for the attachment of any MOLLE compatible pouch. Organization can be accomplished in any way the user wishes. Instead of the lash straps from the RAID, the back panel of RAID II has four one inch ITW/Nexus Tri Glides for tying into or tying down a wide variety of loads. The rear pocket can fit either hydration systems or an ATS frame sheet. Three flapped tube or wire routing ports at the 10, 12, and 1 o’clock are provided. 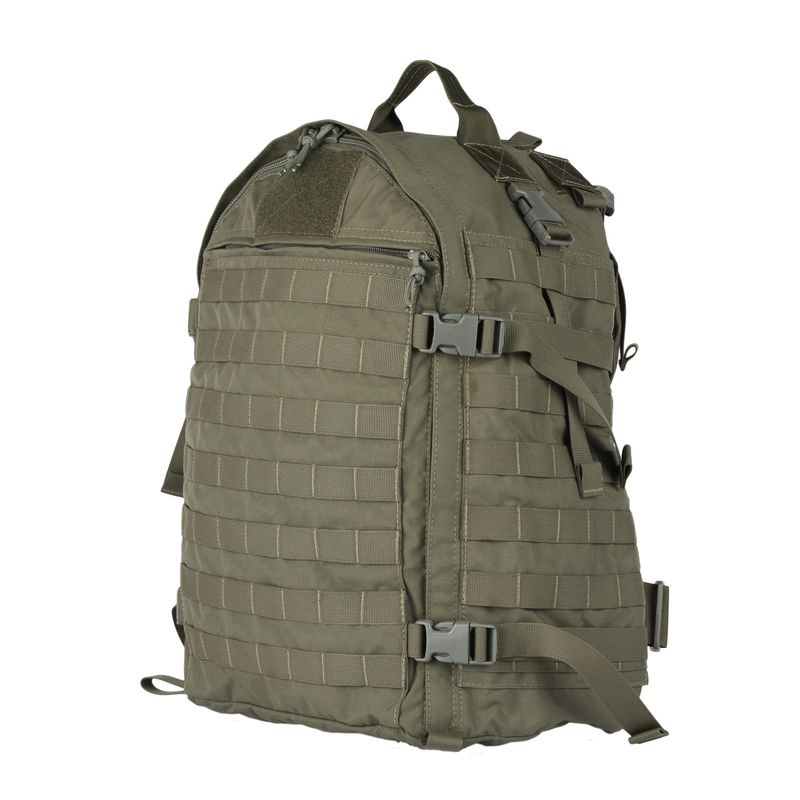 The greatest distinction between the RAID and RAID II packs is the shoulder straps. Through the input of Infantrymen, it was found that the thick straps of the RAID were hard to use when the pack was carried over armor. The 1/2 inch foam straps have been narrowed, and the attachment point strengthened and moved to the back panel rather than the top seam of the pack. Load lifters are provided to improved load carriage. Additionally, there is approximately three inches of vertical travel for the adjustable sternum strap. The pack measures 1512 cubic inches. Due to its 500D Cordura construction, the pack weighs in at only 2 1/2 pounds. The RAID II is covered by the ATS Gear lifetime warranty against manufacturer defects in materials and workmanship. The Cobra 2.6 one day assault pack is a slick front, low-vis redesign of the original ATS Cobra pack. 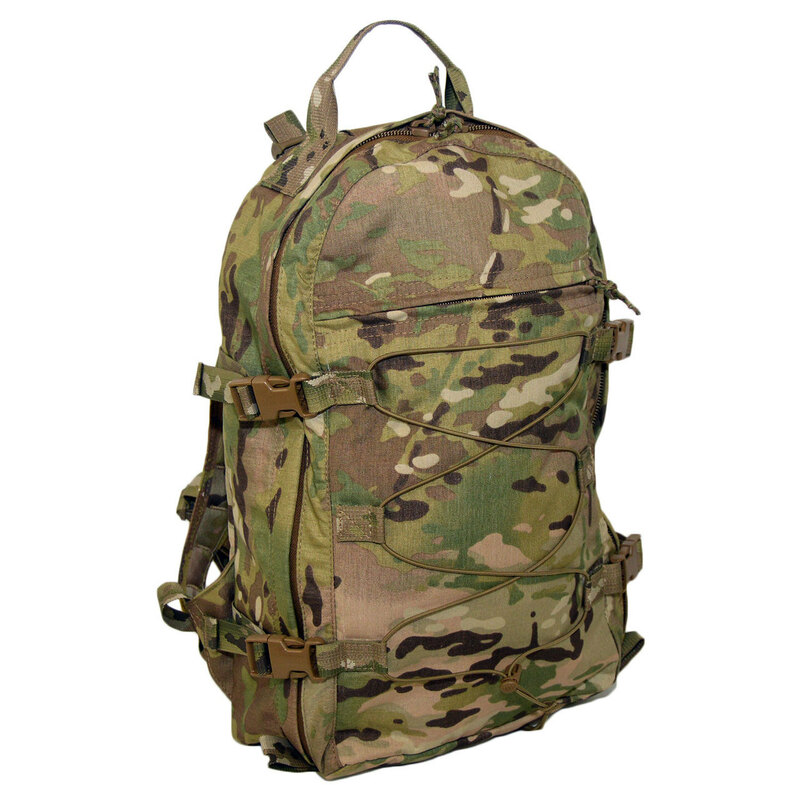 The 2.6 was designed to be a less “military” looking pack with many of the capabilities of a military pack. The 2.6 variant differs from 2.5 in the addition of a shock cord matrix added to the face to allow for the stowage of lightweight items like jackets and the like. 2.6 measures about 19″ tall, 13″ wide and is about 3.75″ deep, and is almost 927 cubic inches. Due to its 500D Cordura construction, the 2.6 weighs in at an even 2 pounds. The Litelok variant weighs a half pound less, totaling 1.5 pounds. The pack has brushed DriLex on the inside of the front panel and on the inside back panel of the pack to utilize the ATS CAP (Cobra Accessory Pouch) line of organizing pouches. There is a hydration carrier slot in the back face and a center mounted port for drink tubes and cable routing. A carry handle is Box X sewn to the top, and there are two rows of PALS webbing on the bottom for attachments and to add a layer of protection to the bottom of the pack. The zippers are the best available: #10 YKK coil zippers and dual zipper pulls, with the front face flat pocket using a #8 YKK coil zipper with a single zipper pull. The pull tabs have been replaced with Mil Spec 550 cord to keep metal-on-metal noise to a minimum. The face zips all the way open for easy access. There are four external compression straps with ITW/Nexus 1″ GTSR side release buckles and a six inch long by two inch wide soft side Velcro panel for patches, placards and tapes. 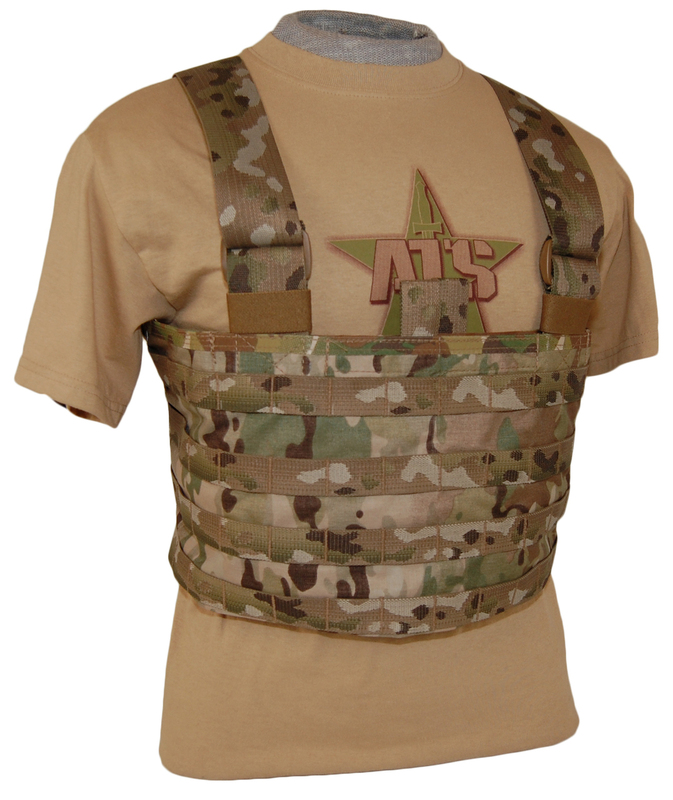 All ATS brand gear is covered by our lifetime warranty against manufacturing defects in materials and workmanship. Aegis was the name of Zeus’s shield, making it an appropriate name for a plate carrier. Unlike Zeus’s shield, the ATS Aegis plate carrier is a scalable system that allows for application to many different mission sets. The Aegis is sized on small, medium, large and XL ESAPI plates, as well as the 10X12 inch plate common to law enforcement. The plate pockets are made so that they can take straight, curved, or multi-curved plates, and are held closed by heavy duty Velcro on the plate pocket flap. The back side of the pocket that rests against the wearer has a thin closed cell foam pad under a layer of Aero Spacer wicking material. Adjustable two inch webbing with removable shoulder pads make up the upper suspension system. The upper chest area of the Aegis has PALS webbing over Velcro, with Velcro sewn to the PALS webbing for attaching MOLLE compatible pouches like the ATS Combat Leader Admin Pouch, but also provides an attachment point for Law Enforcement identifier placards. There are four channels and three rows of MOLLE space on the upper section, with an additional six channels and three rows of MOLLE on the front flap. The lower two rows of PALS webbing are also covered with soft side Velcro to interface with the back side Velcro of the ATS Slimline Modular Chest Harnesses. There are also two ITW/Nexus Quick Attach Surface Mount buckles to interface with the Slimline Modular Chest Harnesses. The back panel of the Aegis features a box-X stitched drag handle with one row of four channels of PALS at the top of the carrier, followed by 5 rows and 6 channels of PALS. There is a 6 inch tall and 9½ inch wide grid of soft side Velcro to attach identifier placards to. The Aegis V2 comes with the military version cummerbund that can accept side plates up to 6X6 inches. The cummerbund has three rows of PALS webbing for attaching any MOLLE compatible pouches or accessories. There is an optional Hybrid cummerbund, available separately, that can be used with the system, and the ATS Chest Harness Adapter Kit that allows the integration of the ATS Slimline Chest Harness with the use of four ITW/Nexus QASM buckles. The Aegis Plate Carrier is made in the USA in the ATS factory in Hopkinsville, KY, using only the finest quality Mil Spec, Berry Amendment compliant materials. Its covered by our lifetime warranty against defects in manufacturing and workmanship. The ATS Slick Front Chest Harness was made at the behest of one of our dealers who’s still an active duty Soldier. The SFCH is patterned on our very popular Modular Chest Harness but without the built in magazine pouches to allow the user to configure the harness as his needs dictate; a useful feature for multiple weapon systems that donâ€™t use interchangeable magazines. The SFCH is about 22 inches wide and about 8 inches tall. It covers 7 rows and 14 channels of MOLLE space. It shares the same map pocket that the MCH harnesses have, which is about 10 inches wide and about 8 inches tall. The ATS MCH Hydration Carrier and Modular Padded H Harness are both compatible with this rig. We build them from 500D Cordura so the harness weighs just over 13 ounces. 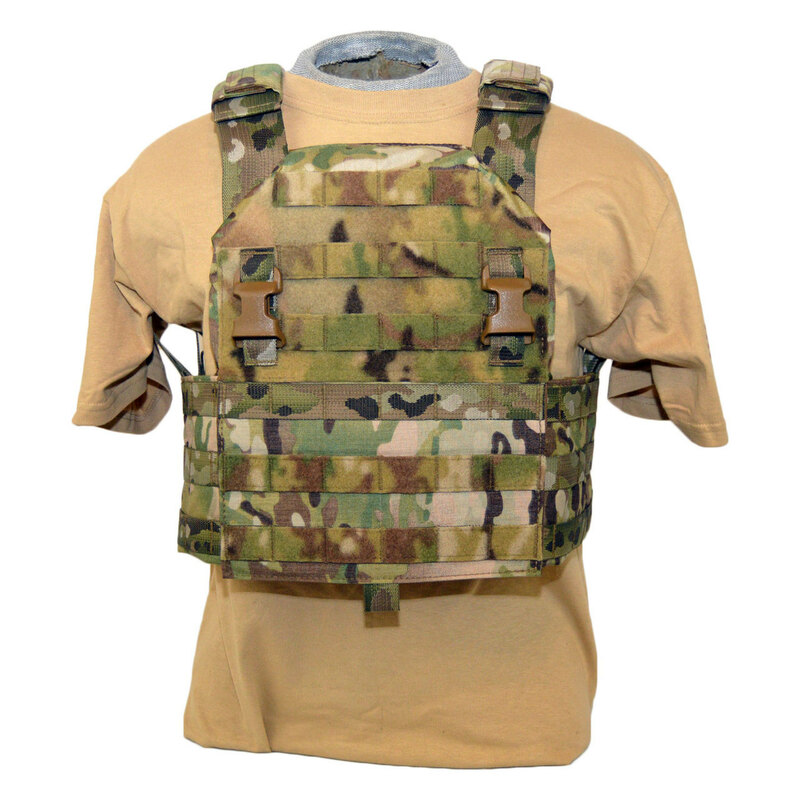 We offer the SFCH in Multicam, Coyote Brown, Ranger Green and ACU. It’ss made in the US of A of the best quality materials and is covered by our lifetime warranty against manufacturer defects. The ATS Medical Pouch-Small is an advanced design that exceeds the current standard for individual first aid kits. When seconds count, standard trauma equipment can be difficult to access because most pouches stays attached to the vest or pack of the casualty. The most revolutionary feature of our Medical Pouch Small is that it can be instantly removed from its MOLLE compatible backing platform and then used independently as the situation dictates. This means that you don’t have to roll the casualty around in the dirt or dump the contents of the pouch out to go to work on him. The difference could be life itself! The pouch is arranged as a “clam-shell” zippered design with elastic webbing on the interior in order to organize the trauma supplies in a consistent fashion. There’s also has an interior slot pocket for smaller items. The ATS Medical Pouch Small will fit everything in the issue IFAK and more. It’s features are rounded out by a cord loop for tie-downs and a drainage grommet. It can be attached to any MOLLE compatible system using our patent-pending L-Strap attachment system. The pouch measures about 7 inches tall, 4½ inches wide and expands to about 5 inches deep, depending on how much is packed in it. It uses 3 channels and 6 rows of MOLLE space. The Medical Pouch Small weighs about 9 ounces empty, due to its 500 denier Cordura construction. 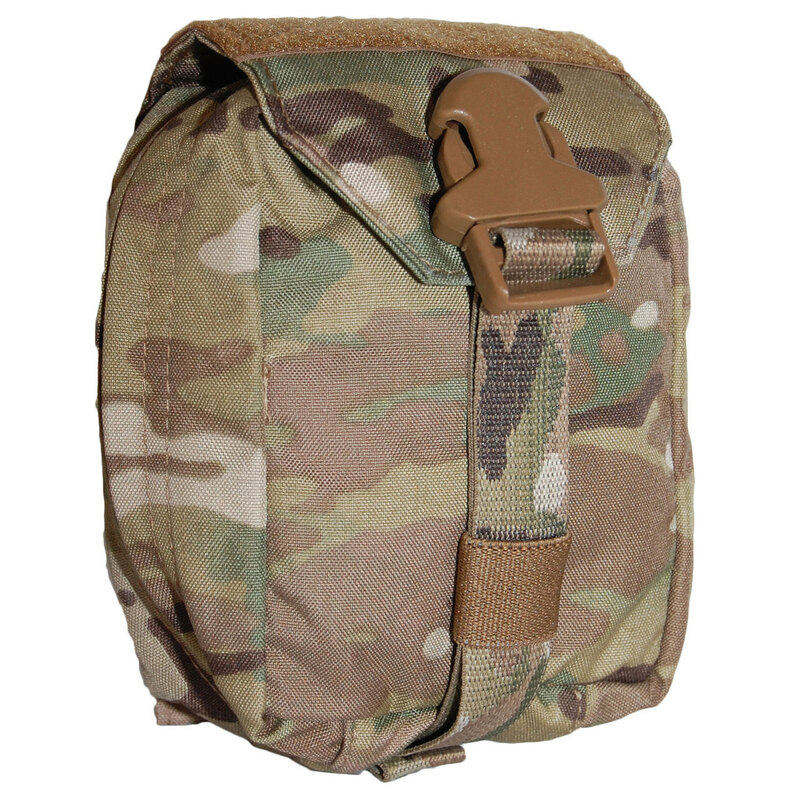 As with the rest of the ATS Tactical Gear line, the World’s Greatest Medical Pouch is made entirely in the USA of the highest quality components and is backed by a lifetime guarantee against defects in materials and workmanship. The ATS Bleeder Pouch was borne from the need for a first aid pouch that fit the height parameters of the ATS War Belt system that was designed to hold supplies for controlling bleeding from gunshot wounds. The system consists of a MOLLE Panel that stays permanently attached to your modular platform, and a removable pouch. This is significant because the first aid pouch is most often used by another on the wounded victim, and having the pouch able to be removed from the victim allows access to the contents without having to roll the already wounded individual around in the dirt to get supplies from his first aid kit. The pouch is removed from the MOLLE Panel by popping an ITW/Nexus side release buckle on the retaining strap, grabbing the horizontal tear away loop and pulling. Instead of a red handle, the handle on the Bleeder Pouch is color matched so that it doesn’t create a visually distinctive mark. It is held secure to the body of the pouch when not in use by Velcro. When opened, the body side of the pouch has two vertical loops of one inch Elastic, while the face side of the pouch has a vertical loop and two horizontal loops, also of one inch Elastic. The pouch is closed by a #8 YKK zipper with 550 Paracord zipper pulls. Owing to its 500D Cordura construction, the Bleeder Pouch Rip Away weighs just 6 3/8 ounces. The pouch measures about 6 1/4 inches wide, about 4 1/2 inches tall, and about 4 1/2 inches deep. The Bleeder Pouch Rip Away is available in Multicam, Coyote Brown and Ranger Green. Black and ACU are available as special order colors. As with all ATS Tactical brand products, the system is made in the USA of the best quality materials available, and is covered by a lifetime warranty against manufacturer’s defects in materials or workmanship. The ATS MOLLE Dump Pouch is sized to hold six M4 30-round mags. It also works perfectly as a carrying pouch for shotgun shells and allows for convenient carrying/loading of several boxes of shells. The ATS MOLLE Dump Pouch also serves as a multipurpose utility pouch suitable for evidence collection or general carry of items that aren’t a good fit for more traditional pouches. The MOLLE Dump Pouch is constructed of either 500D Cordura nylon or ultra light Litelok material, which weighs about 30% less than 500D Cordura. The Litelok pouch tips the scales at just over 2.5 ounces, the 500D version about 3.5 ounces. It uses shock cord and ITW/Nexus Toaster Cord Loc to adjust the size of the opening of the pouch. A 3″ webbing flap doubles as a lid or can be concealed completely within the bag. It also serves to secure the pouch in its rolled up position. In its folded state, the ATS MOLLE Dump Pouch is only 3″ x 4″ x 1.75″ and can be attached to MOLLE or PALS webbing by means of the two patent pending L Strap modular attachment straps. There is a grommet located on the bottom allows for quick drainage. 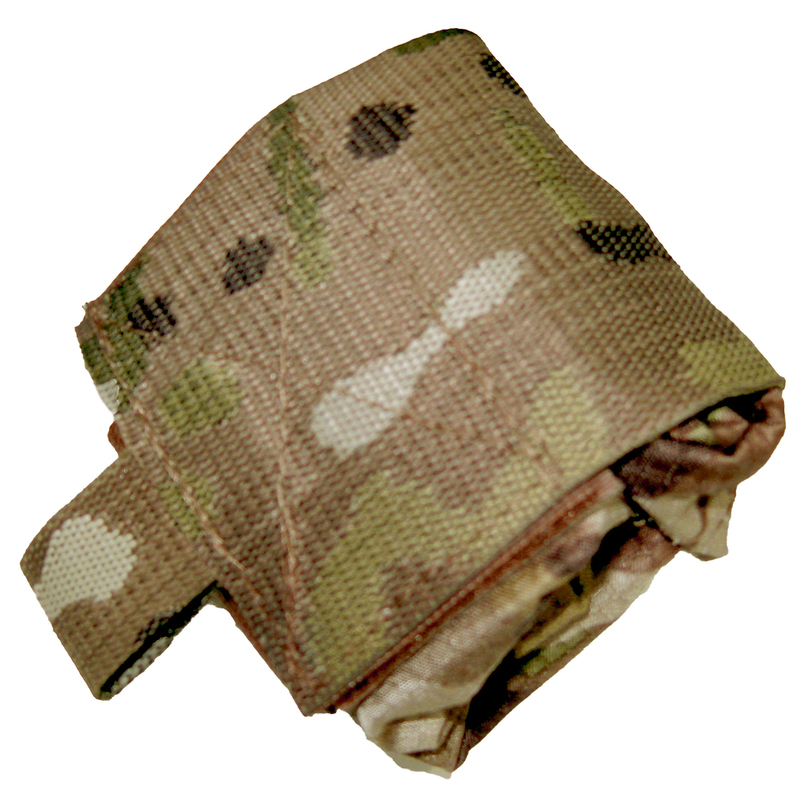 We offer the MOLLE Dump Pouch in Litelok in Multicam only. Like all our products, the ATS MOLLE Dump Pouch is made in the USA of quality, mil-spec components and is covered by our lifetime warranty. The ATS Cobra Buckle Rigger’s Belt uses the excellent AustriAlpin Cobra buckle for both ease of use and incredible strength. The Cobra buckle is rated to 11kN, over 2470 pounds of force. That’s strong. In order to make use of that strength, we built the belt from 1.72″ Type 13 Mil Spec parachute-grade webbing, stitching it together with 69 pound nylon thread. The belt is reinforced with a 4 inch long “W” stitch and has a “soft loop” for personal retention lanyard tie ins. To increase the strength even more, we added 5 lengthwise stitches, which also increases the stiffness somewhat. The end of the belt has been rounded with a hot cutter so the running end won”t snag. We offer the Cobra Buckle Rigger Belt in Coyote Brown with a coyote brown buckle, or in Ranger Green and black with black buckles. They”re made in the USA and covered by the ATS Gear lifetime warranty against manufacturer defects. Sizing lengths are measured from the center of the female side of the buckle, inside the belt to the middle of the male side of the buckle for a center to center measurement. The ATS War Belt offers a fresh perspective on the padded first line belt. Long gone are the days of an old LC-1 belt with a cobbled together padded backing. 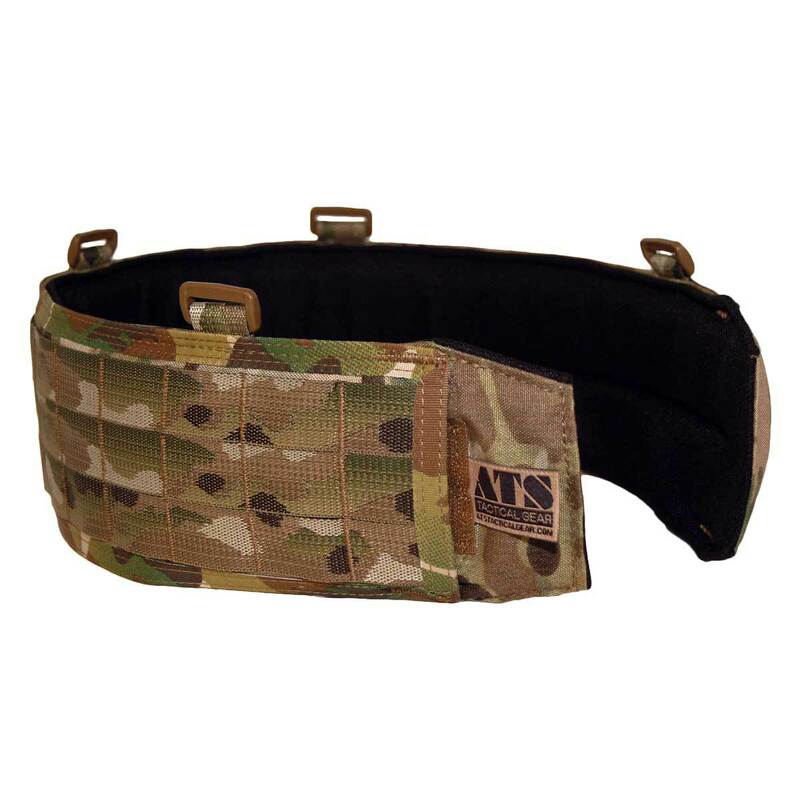 The ATS War Belt is a padded cover that is designed to be used with a belt system up to 2″ in width. The inside of the War Belt is lined with a strip of 2″ wide hard side (male) Velcro to interface with duty belt soft side (female) Velcro to keep the belt from shifting during hard use. It offers full length 1/4″ high-density, closed cell foam padding for comfort and is lined with Dri-Lex moisture wicking material on the inside of the belt. There are 4 ITW/Nexus 1″ Looplocs on the top edge of the belt for using the optional suspenders. The outside cover of the War Belt is bar tacked with three stacked rows of PALS webbing for use with any MOLLE compatible pouches. The outer cover is opened along the bottom, allowing access to the duty belt within (belt not included). This allows the user to hang pouches, holsters, and drop-leg hangers that are not MOLLE compatible anywhere along the inner belt. 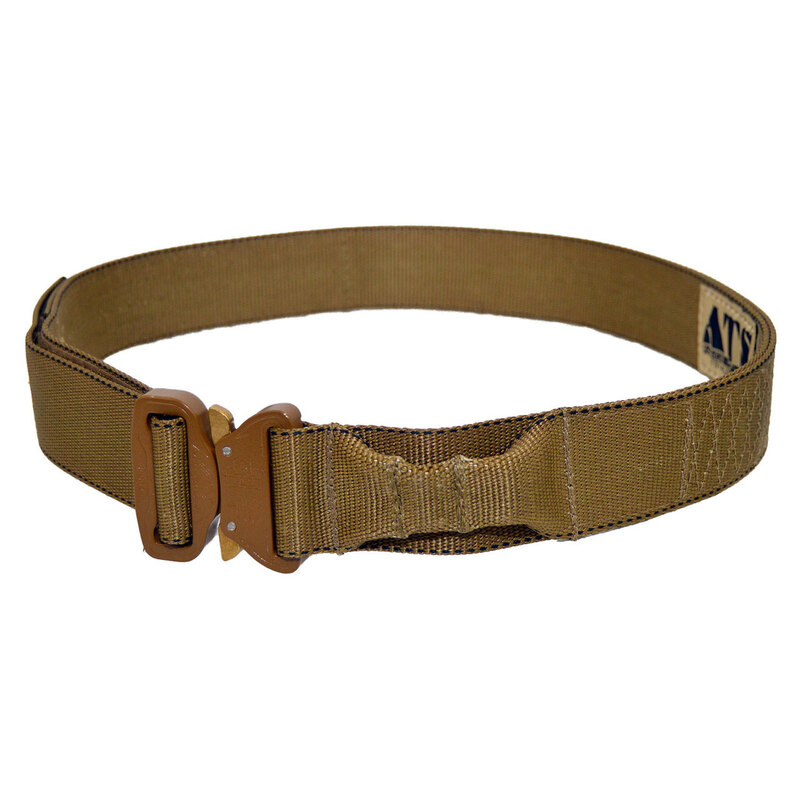 The padded belt is sized to work with our ATS War Belt Liner Belt or Cobra Rigger’s Belt (Large with Large, etc.). As with all our products the ATS War Belt is made in the USA and comes with a lifetime guarantee against defects in materials and workmanship.